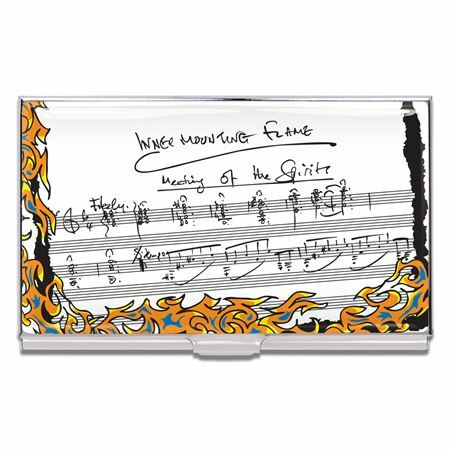 Order your ACME J McLaughlin Designed Jazz The Inner Mounting Flame Card Case today from FahrneysPens.com. Fine Pens, Refills & Luxurious Gifts – great prices & fast shipping. Carry the works of noted musical artists in your hand with the ACME J McLaughlin Designed Jazz The Inner Mounting Flame Card Case. The Inner Mounting Flame was designed by J McLaughlin, an English jazz and jazz fusion guitarist and composer. McLaughlin has been cited as a major influence on many generations from the '70s and '80s fusion guitarists, changing the evolution of guitar playing. The Inner Mounting Flame pattern is screen printed on the steel card case, layered with clear lacquer and trimmed in silver plate. Each piece makes a great gift for anyone who appreciates inspired, modern design. As John says: "Writing will never go out of style"